With our Business and Enterprise (previously known as Elite) subscriptions you now have access to a brand new and cool feature that will help you put your product out there in a more efficient way. Product tags help you provide more information or promo content about your products and a quick way for customers to shop products directly from your catalog. First, you need to head over to the Interactions tab that can be found on the left side of the editor. 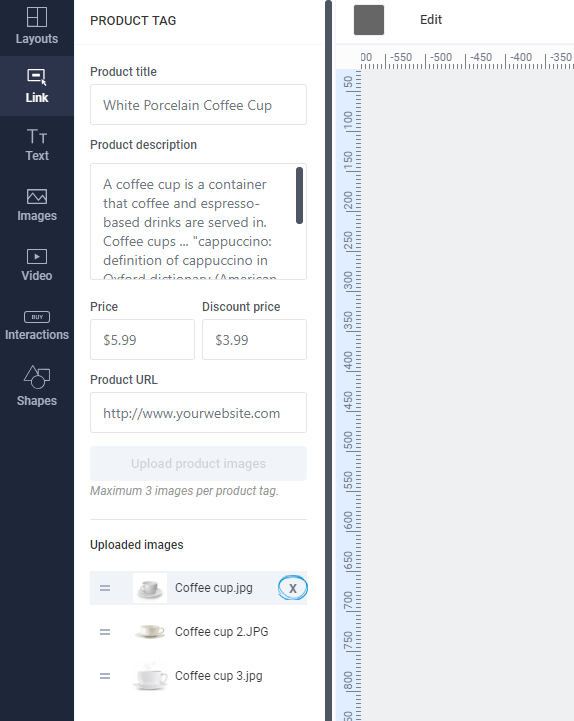 You will then be able to see the Product tag element and add it to your page. 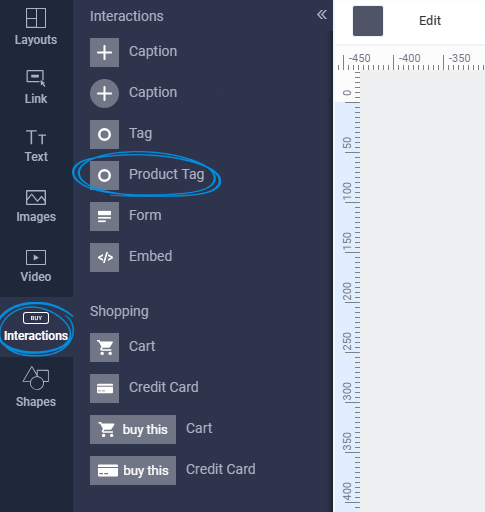 Once the Product tag is placed on the page, simply click on it and you will have a new option called Edit in the upper left section of your editor. 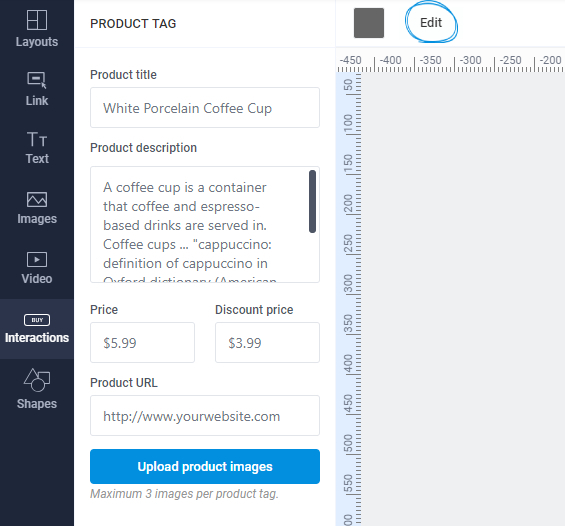 Upon clicking the Edit button you will have the option to enter a product title, a product description, your URL page for your product, the price and last but not least, images of your product. The price fields allow you to enter the original price as well as the discounted price, displaying the old price and the new one. 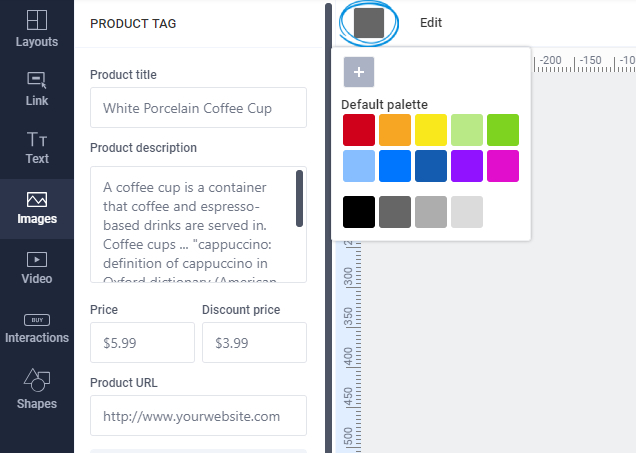 In order to make the tag blend in with the theme of your catalog, you can even change the color next to the Edit button. 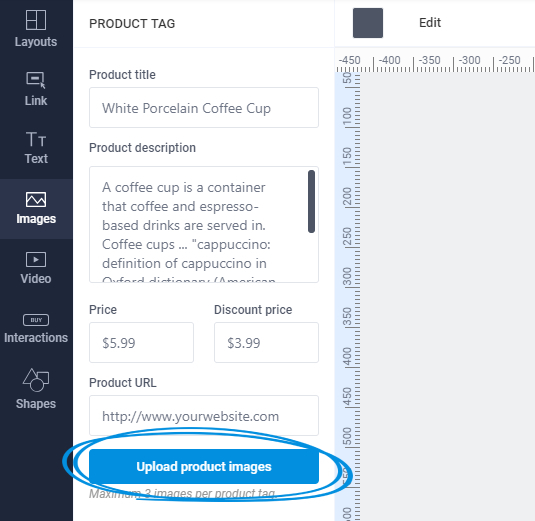 To add images of your product, simply click on the Upload product images button and upload up to 3 images. You can upload the images in any order and reorder them later in the editor by clicking and dragging the images by the = icon on the left of the image. If you wish to remove one of the images, simply hover your mouse over the image in the editor and click on the X that appears on the right. 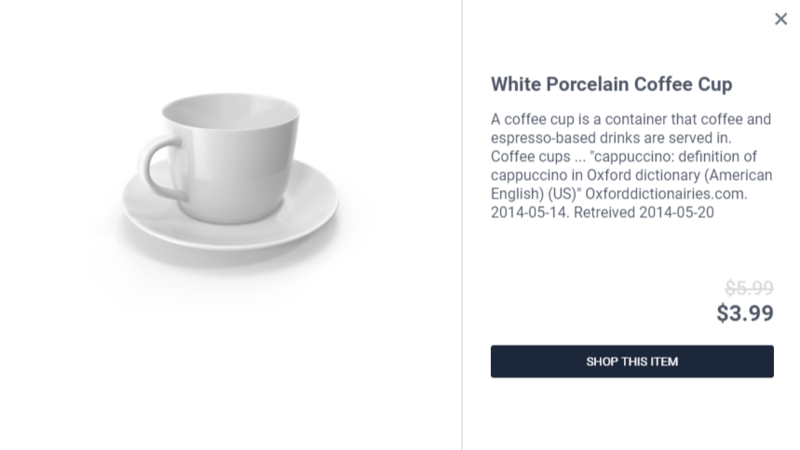 When a reader clicks on a Product Tag, a small overlay will open that provides them with details about your product: title, description, old/new price and a "Shop this Item" button that will lead to the URL where you sell your product. If you added an image, when you click on the product tag, the image will appear on the left side of the overlay. When you upload more than one image, they will all appear at the bottom of the left half of the overlay and you can click on each one to preview it. If you have any questions about this new feature please contact us via the live chat.